Our feet help us to explore the world. Therefore, any sort of foot pain can cause you a lot of misery. Unfortunately, not much attention has been paid to issues concerning pain at the foot. You can either feel pain on outside of foot (lateral foot pain) or on the inside of the foot (medial foot pain). This article will focus on the causes of the former condition. The most common causes of pain on outside of foot are ankle sprains. 85% of foot injuries are of this kind. An ankle sprain affects any of the ligaments, but mostly the Anterior Talofibular Ligament (ATFL). Damage to this ligament occurs when your foot rolls inwards and your ankle outwards, thus referred to as an inversion injury. 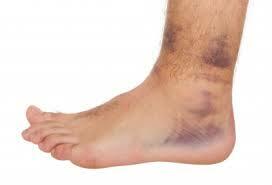 This results in some or all the ligaments being torn and causing foot pain, instability, bruising and swelling. 35% of the people who recover from an ankle sprain normally experience the same problem multiple times because of the recurrent instability and pain. To avoid this, rehabilitation is advisable after the first injury. Stress fractures develop slowly. For this reason, they do not feel like a fracture. Because they are tiny fractures, you might not experience any pain until you place excess pressure on the bone, for example when running. The pain becomes more intense as you run until the bone breaks. This commonly occurs midway through the 5th metatarsal. To test whether this is the cause of pain on outside of foot, try this: bend the long bone on the outside of foot by holding its end and pushing up from the middle using your thumb. If you experience any pain at the center of the shaft, then you probably need to rest your foot for 6 weeks. If you keep exercising when you have a stress fracture, there are chances of breaking your bone eventually. Peroneal tendons run on the outside of the ankle. If an activity that irritates the tendon is repeated or the tendon is overused, it swells, gets inflamed and thickens. When the peroneal tendon suffers from overuse, it is referred to as peroneal tendinosis. People who have tried out a new exercise routine or increased their workout load are prone to this condition. Repetitive use of the ankle such as marathon running and improper footwear can cause it as well. 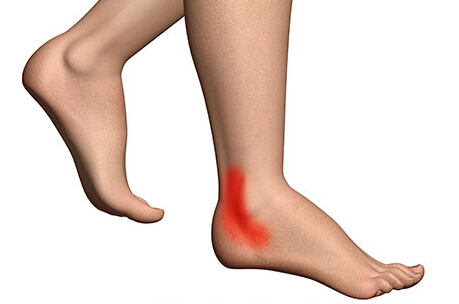 Peroneal tendinosis is characterized by pain on outside of the back of the ankle. In most cases, patients will heal without surgery. Resting is advisable, and in some cases a patient might have to go to rehab. If resting does not help, surgery might be recommended to rectify the injury to the tendon. Bunions commonly cause deformity and pain on the outside of foot along the large toe. They occur when the big toe rotates inwards and points at other toes. Because of this rotation, the bone at its base sticks out on the side. This results in redness, inflammation, side-foot pain as well as swelling. A bunion is medically known as hallux valgus. Bunions are thought to be genetic, more so for people with very flexible joints. However, they can also develop because of improper footwear that squashes the toes inwards. The risk of bunions is increased by conditions like rheumatoid arthritis and gout. Toe stretchers help realign the toes in mild cases. For more severe cases, surgery might be required. Cuboid syndrome mostly goes without treatment causing symptoms to be present over a long period of time. This syndrome is a result of a small foot bone, the cuboid, being dislocated partially after an ankle sprain or continued strain on the foot. Normally, you will feel pain on outside of foot, which could spread to the toes. The pain is mostly felt in the morning when walking on uneven ground, hopping or jumping. The affected area will be tender to touch with some swelling and redness. When properly diagnosed, the symptoms will fade away with a few weeks of rest. 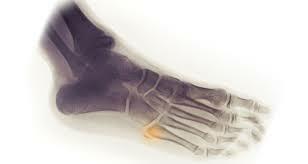 Tarsal coalition occurs when two or more foot bones are connected by an excess bar of bone. It is a congenital condition and symptoms usually are manifested between the ages of 10-19, causing pain, foot cramps and fatigue. This condition might cause you to walk abnormally. It might also result in other foot problems like abnormal foot biomechanics and ankle sprains. Treatment can either be surgery, making the foot immobile by casting or shoe inserts. Calluses and corns can appear anywhere on the foot, but mostly on side and top of foot. They form where the skin is exposed to continuous friction. The body tries to protect it by adding layers of skin. Calluses are mostly painless but corns affect the inner parts of the skin causing pain. However, they are generally simple to treat with a pumice stone and special cream. Arthritis will cause pain anywhere in the foot, but in most cases pain is felt inside of foot. There 2 types of arthritis – rheumatoid arthritis (inflammatory arthritis) and osteoarthritis (degenerative arthritis). Rheumatoid arthritis is the most common type. Its symptoms come and go. There are several over-the-counter medications that will ease the pain, swelling and other symptoms. For example, Tylenolcan instantly and effectively get the pain under control. Medications like aspirin and ibuprofen will help with the inflammation too. Effective and common home remedies include ice massage, rest and use of crutches. Resting is the best way of getting rid of foot pain. Ice application can work when ice in a plastic bag or towel is placed on the affected area for 20 minutes. Crutches help to elevate the amount of pressure placed on the foot while walking. Pain and swelling can be treated by elevation and compression as well. In the case of corns, band aids can help relieve the pain. Additionally, Epsom salt soaks also do a wonderful job in reducing the inflammation and swelling. Add Epsom salt to water enough to cover the affected area until it cannot dissolve. Soak your feet for 20 minutes daily. You can also use a foam roller along the side of your foot which is painful for relief.